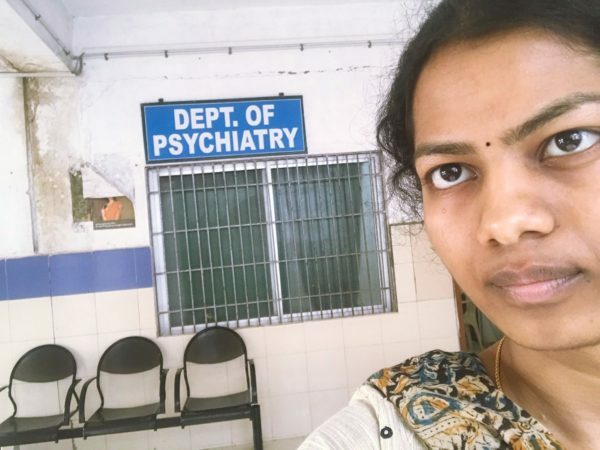 I am going to spend this blog telling you a little bit about my time observing in the psychiatry department in the Santhiram General Hospital. I had never shadowed a psychiatrist before so it was all the more interesting. Not only did I learn about various mental disorders, but I also got to listen to each patient’s story. This is the hall of the psychiatry department in the Santhiram General Hospital in India. The PG students and psychiatrists in Santhiram spent almost an hour with each new patient so that they can at least get a general idea of the possible causes of the patient’s symptoms. More specially, they wanted to determine if there was a major life event that could have triggered or worsened the patients’ symptoms. One boy came in, saying that he had been vomiting and having headaches for months. He went to numerous specialists to check if he was physically ill, but all of the reports had turned out to be normal. He said that his persistent headaches were causing him to become so easily irritated that he now prefers to be alone most of the time. After talking with him for around fifteen minutes, the psychiatrist was able to find out that his family had begun to struggle financially after a major event had occurred in his family. This only happened a few months ago, around the time when his symptoms had worsened. A few minutes later, the doctor thought that this boy might have a psychosomatic illness because his symptoms and the context of his symptoms were very consistent with this illness. I really enjoyed listening to each patient’s story because it was the first department in Santhiram that I had observed where the doctor spent more than fifteen minutes on average with each patient. The doctors talk with the patients in this room to learn more about the patients’ symptoms and stories. 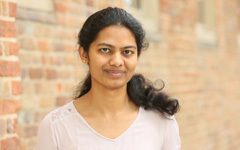 In India, diagnoses related to psychiatric disorders are based on ICD-10, which is the tenth revision of the International Statistical Classification of Diseases and Related Health Problems, rather than DSM-V, which is the Diagnostic and Statistical Manual of Mental Disorders, Fifth Edition. When I asked what the most common illnesses in psychiatry are in Santhiram, one of the PG students said that many patients have depression, anxiety, OCD, conversion disorder, personality disorders, schizophrenia, bipolar disorder, mania, or erectile dysfunction. She said that in reality, patients come in with a wide-range of symptoms. But, eating disorders are not very common, which stood out to me because in the US, even I know a few people who struggle with eating disorders. Alcoholics also come in for counselling. Just during my time in the psychiatry department, I saw two men who were alcoholics who come in for counselling or medications; one of these men left just after a few minutes because he did not want to wait for the psychiatrist. When I asked the head of the department how the psychiatry department in Santhiram could be improved, he mentioned three things. He said that first and foremost, patients should become more aware of psychiatric illnesses; the hospital is located in a rural area so many patients don’t have a lot of education. Second, people should be reached in their homes; this could be done by setting up camps in villages to teach people about psychiatry. Third, incentives should be provided, such as free investigations (lab tests, CT scans) if required. By observing in the psychiatry department, I was not only introduced to diagnoses of psychiatry illnesses first-hand, but I was introduced to the lives of these patients, particularly their financial struggles and their perspectives of their struggles.